Okay so there is a lot of stuff packed into this trailer, but will the movie feel as crowded? The last time we had a Spider-Man movie with this many villains it led to the entire franchise being rebooted, so it’s a little surprising to see so many crammed into this sequel. Except this time it looks like there may be a good plan behind it and it was mentioned in the first film. Oscorp seems to be at the centre of all things superpower related. Peter Parker was bitten by one of their genetically altered spiders and now it looks like the company may be responsible for not only these villains, but future ones as well. In the above still from the trailer you can see what looks like robotic wings and tentacles, which will likely belong to Vulture and Doctor Octopus in future Spider-Man films. This level of planning makes up for a lot of the worries about the overcrowded roster of villains as it seems like Harry Osborn, who will be the Green Goblin, is sort of a ring leader with Rhino and Electro almost as henchmen. Though it’s a lot more organised than the three random villains from the third Sam Raimi Spider-Man movie, it is a little disappointing that Jamie Fox’s Electro doesn’t seem to be the main bad guy despite being at the centre of the ad campaign. Dane Dehaan’s version of Harry Osborn has apparently skipped his dad to take on the title, which could mean that this time it will be the father avenging his son rather than the other way around. The big question is which one will kill Gwen Stacy? There have been a number of other interesting sightings in the trailer. The above picture may or may not be Felicia Hardy aka Black Cat nothing is really confirmed about who Felicity Jones is playing. Then there is this strange part that is a little confusing. If Shailene Woodley was cut from the film then why is she still in the trailer? Maybe she’ll just be ‘girl who almost gets crushed by car’ rather than the much more well known character Mary Jane Watson. What do you think? Check out the trailer and leave your thoughts in the comments below. 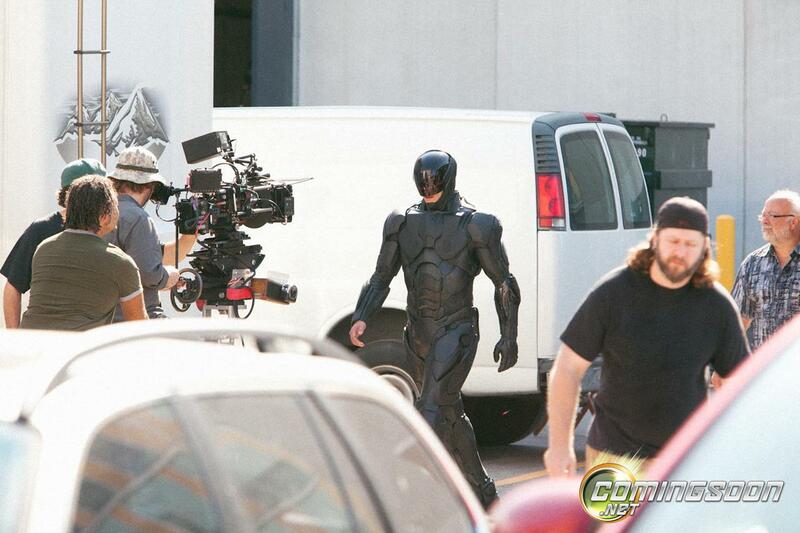 Clearly Robocop is no match for the advanced technology of the 21st century as set pictures have hit the web after only one day of shooting. 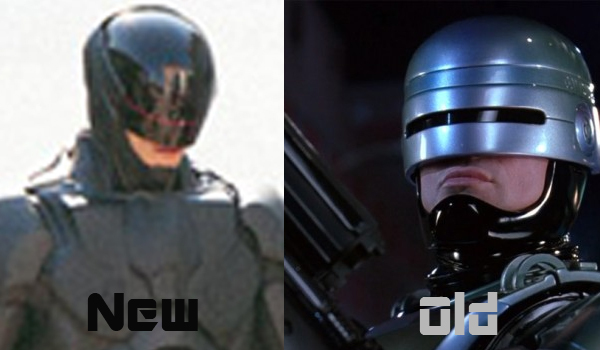 The remake of Robocop began filming in Toronto today and we’re already getting a look at the lead character. For those that don’t know, Robocop is the story of a policeman who is nearly dead when a company steps in and saves him with advanced technology. Then he returns to his job, only this time he has built in weapons and gadgets. The two pictures that were released show that the costume has changed quite a bit, not that this is a bad thing. This new version of the suit looks good, but it’s kind of reminiscent of the bat suit. Though that could be because of the colour, which is strangely black. It seems like the original colour, silver, would better fit the story. 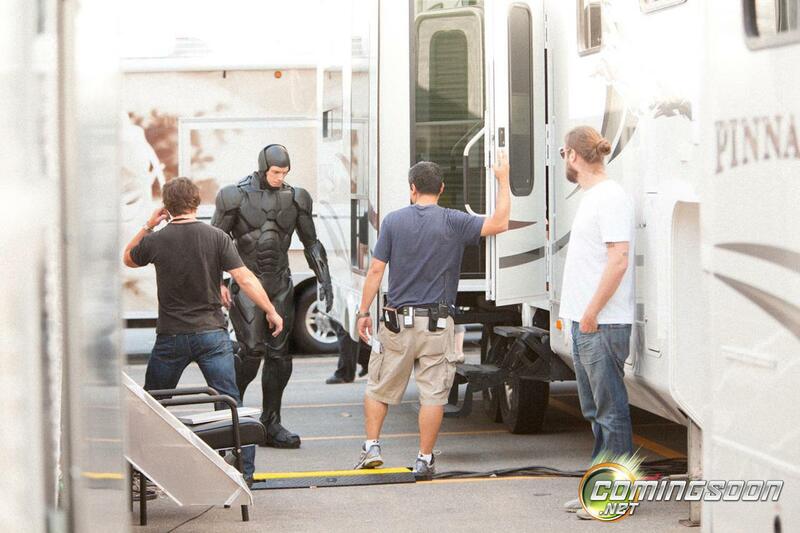 It’s obviously an attempt to try make the suit look more modern, but still it may be a bit too far of a departure. A combination between the old and new design would be nice, though it’s a little too late now. What do you think? Are you excited about this remake? Which version of the suit do you prefer? Would you like to see a cross between both designs? Let me know by voting and leaving a comment below. Also, don’t forget to subscribe and click the like button. Though it’s not yet clear if any other characters will be returning, Capcom have confirmed that Vergil will play a big part in the upcoming reboot of the Devil May Cry franchise. Vergil appeared as a boss in the first DMC game and was the main antagonist in the prequel Devil May Cry 3. His role in the third game has made him a fan favourite, rivalling Dante as the most popular character in the series. It isn’t surprising that Ninja Theory are bringing him into the new franchise, but will they be able to do justice to the original Vergil? As with Dante, Vergil has undergone some changes. The old Vergil sought power and wanted to rule, while this new version seems to have the opposite in mine. While Dante grew up in orphanages and detention centres, Vergil was adopted by a wealthy family and the two haven’t seen each other since. Vergil grew up living it large and getting properly educated, but then demons killed his adoptive parents igniting hatred in him. Determined to take down the demons that secretly run society, Vergil began the order and became the masked man that has been shown in previous DmC trailers. 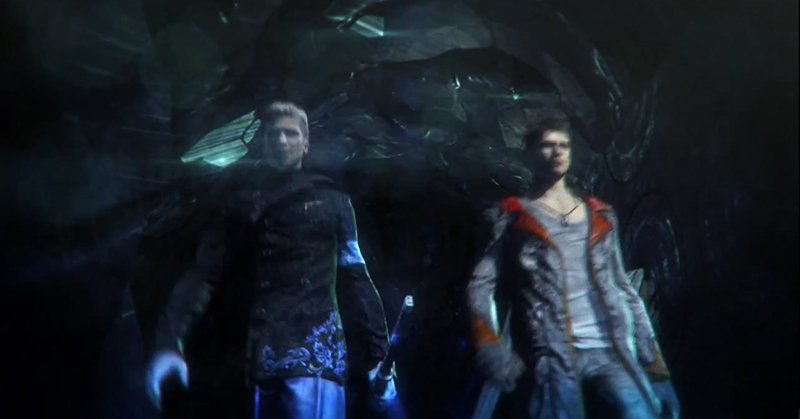 Vergil’s appearance has been altered in keeping with the new character designs, though he still has blond, silver/grey, hair. 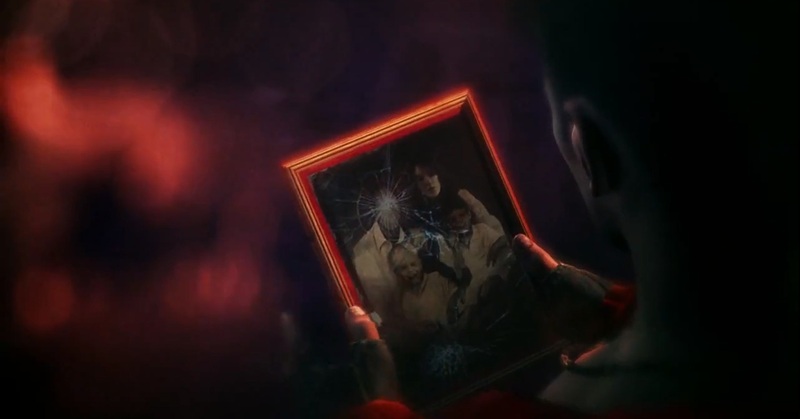 In fact, an old family photo, shown in the new trailer, shows that he has always had this colour hair while Dante’s has always been dark. This essentially puts to rest the idea of Dante’s hair turning lighter as the game goes on. 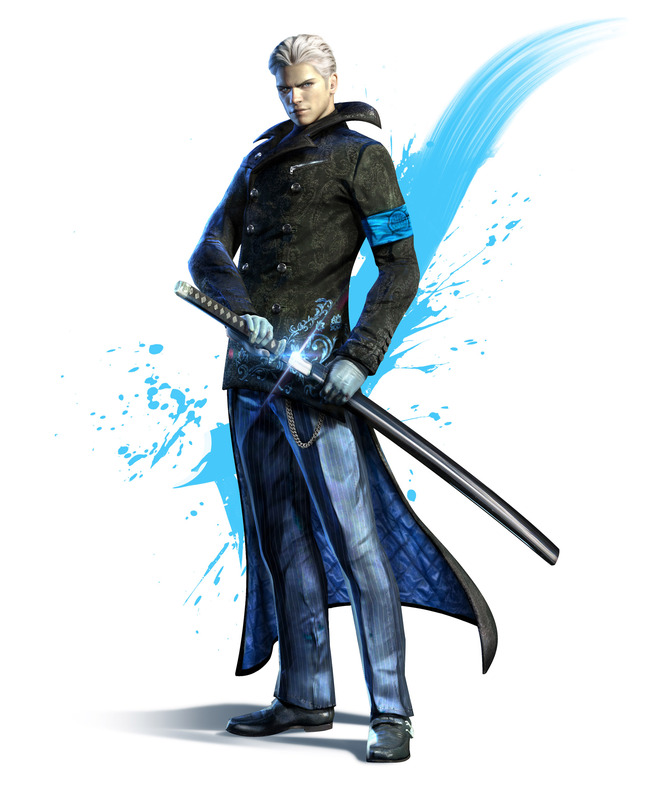 As with the original Vergil, the colour blue is still a big part of his costume. Interestingly, he is also shown to have a katana sword, Yomato, like he did in the previous titles. Though he may be on the good side Vergil does not seem to have the same regard for human life as Dante. 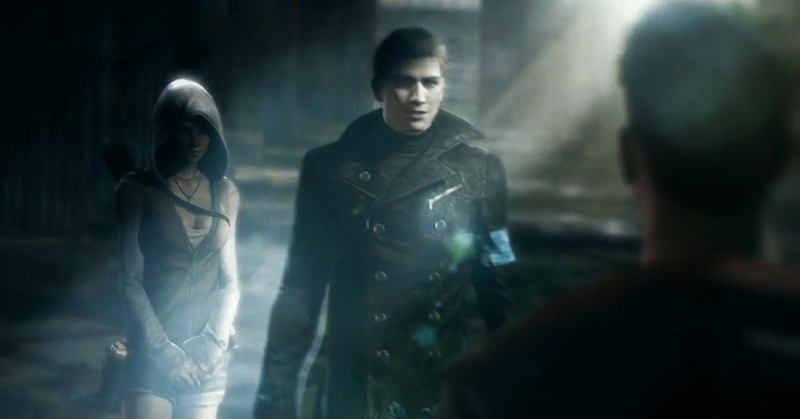 Vergil is willing to let Kat, who is working for him, die while Dante insists on saving her. This may be a sign that Vergil might not be as good as he’d like Dante to think and may actually have an evil plan up his sleeve, one that he needs to use Dante to complete. What do you think? Are you happy that Vergil is part of the new DMC franchise? Who else would you like to see featured the reboot? Would you prefer if the original characters were left alone? Let me know by voting and leaving a comment below. Also, don’t forget to subscribe and like the like button. Sony Pictures have released another trailer for the upcoming addition to the Resident Evil film franchise, Resident Evil: Retribution. It’s never easy converting a story from one medium to another, there will always be diehard fans that are understandable protective of the original. When Resident Evil made the transition from game to film it wasn’t so much about keeping loyal to the original story but rather the feeling of playing the game, which is why I split fans. Some weren’t able to get over the lack of familiar characters and story, while others appreciated the uneasy atmosphere that mirrored the one in the games. As the series progressed it introduced more elements and characters from the games, but began to lose any resemblance of tone or atmosphere. 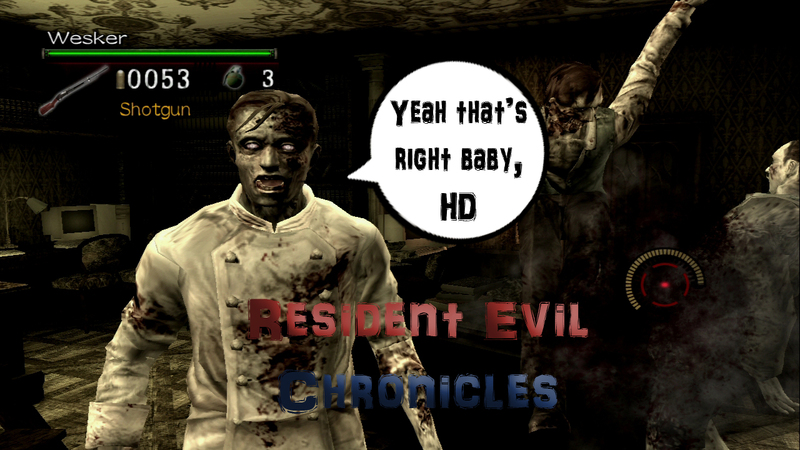 For this reason many fans of the games openly dislike the series as it doesn’t feel like a Resident Evil experience and the characters do not behave like their game counterparts. From the latest trailer it appears that the film franchise will be moving even further away from the story of the games. There is a lot of information about the story in this trailer. It was previously stated that a number of characters, who featured in previous movies, would not be returning in this film because they were captured by Umbrella. The trailer adds to this by showing that Alice was also captured and is being held in a fictional reality were she is married to Carlos Oliveira and the two of them have a child together. Ada Wong finds Alice and reveals that the life she is experiencing isn’t real and is only implanted memories. It’s still a little confusing about who is and isn’t a clone, especially since Alice is seen having two different hairstyles throughout the trailer. The narration states that Umbrella has used Alice to perfect the virus, which brings on a whole new theory of how her deceased friends have returned; maybe they were actually brought back with the virus. Though considering Carlos was blown up and jigsaw experts would be require to bring the original James ‘One’ Shade clones are still the most logical bet, which is a little disappointing. As a fan of both the movie and game series, I thought the trailer looked really good. The story looks interesting and I’m looking forward to actually understanding it. It seems over the top with lots of action and really if that’s not what you want to see then this isn’t the right franchise for you. It doesn’t resemble the games so much in terms of story, but there are a lot of elements from the games that can be seen throughout the trailer. Most obviously are the zombies and B.O.W.s which strongly mirror those of the games. More characters from the games have been brought into the film as well as a proper return for Jill Valentine who only briefly appeared that the end of Afterlife after being absent from Extinction without any explanation. The movie comes out on the 14th of September 2012, until then all we can do is speculate but isn’t that one of the best parts of being obsessed with movies? Maybe that’s just me. What do you think? Did you enjoy the trailer? Are you planning on seeing the movie? Do you like when characters from the game appear in the films or do you think they don’t carry over well? Let me know by voting and leaving a comment below. 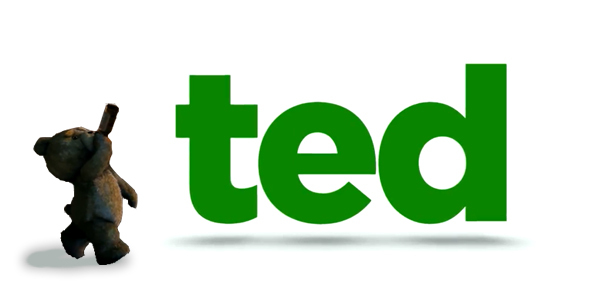 Also, don’t forget to subscribe and, if you like this post, click the like button. If you enjoy speculating feel free to add your theories in the comment section. Capcom have revealed a lot more information about some of their upcoming titles at this year’s Captivate. 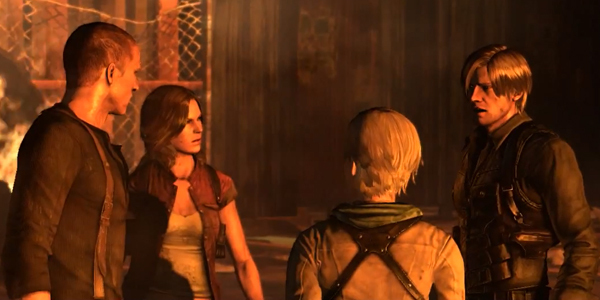 Amongst the games shown was Resident Evil 6, which has been given a new, much sooner, release date. 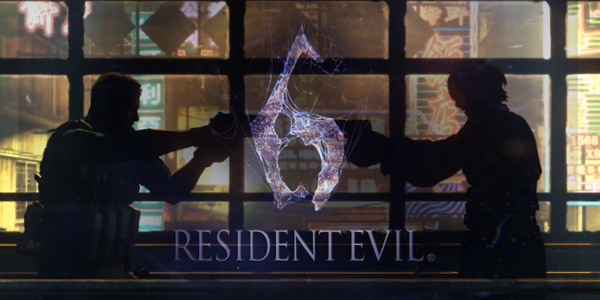 The sixth, numbered, game in the Resident Evil franchise will now hit shelves on the 2nd of October, over a month earlier than it was previously expected to arrive. This news comes at the end of a very informative, action packed trailer that reveals that, though it definitely is Sherry and not Ashley that appears alongside the mysterious mercenary, I was right about who Chris was referring to in the previous trailer. That’s right, it’s Ada Wong. 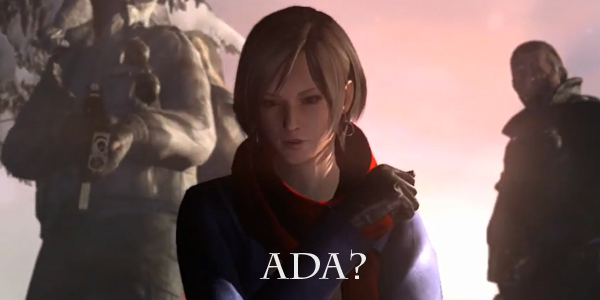 Ada last appeared in Resident Evil 4 and goes back as far as the second game. She and Leon share a complicated story, which may be part of the reason why he defends her in the trailer, even going as far as pointing his gun at Chris, despite the fact that she so obviously has some major involvement in the chaos that is going on all around the world. Ada also reveals the identity of the mercenary character and we were all wrong. He is not HUNK or Alex Wesker, he is Jake Muller the son of Albert Wesker. Don’t feel too bad though, Jake didn’t see it coming either. Due to his genetic relation to Wesker, his blood is important, which is why Ada is hunting him down and Sherry is, I’m going to say, protecting him. 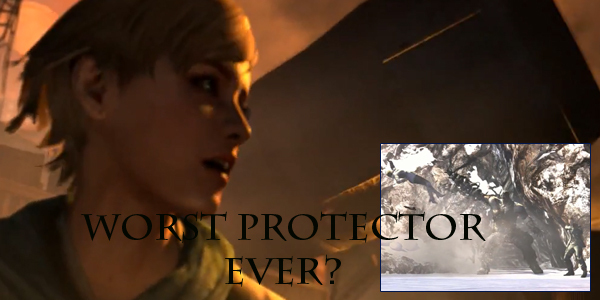 She seems to just constantly get hit by things so she probably isn’t that good a protector. Other details revealed were that players would be able to choose a campaign and play it through to completion; this means that you can play each team’s story from start to finish without changing to another part of the way through. However, the stories are not all separate from each other and there will be overlapping. In fact, the characters will come across each other a number of times in the location that is common to them all, China. Eventually each set of partners will make their way to China were they will face off with the new virus on the block, the C-virus, and the people responsible for its release. The C-virus is similar to its predecessors, it turns people into zombies, real zombies, but as with previous viruses, G and T, it causes the zombies to behave a little differently. 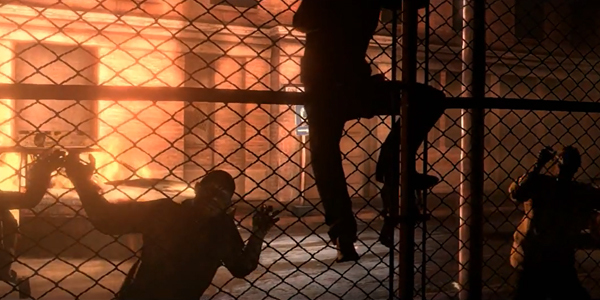 When infected by the C-virus, zombies can enjoy the freedom to run, jump and even occasionally hold weapons. Infection of the C-virus can be caused by a disgusting puss filled zombie that sprays a mist of the virus out of its pores. The effect appears to be nearly instantaneous. Breathing in this mist is a sure fire way to become a running, jumping, occasional weapon holding zombie. It will be interesting to see how this infectious enemy is incorporated into the game, though it won’t be the first time zombies have been able to infect players. According to Capcom, Chris will not be the same fun loving guy he was in previous Resident Evil instalments; his personality has changed as a result of him going through some personal tragedy six months before the main events of the game. This is why his part of the game opens up six months before the main events of the game. From what we’ve seen so far, it’s a fair guess that the burning, melting and mutating of most of his team, at the hands of none other than Ada Wong, is probably the cause for his transformation, but nothing solid has been announced regarding this. That alone is definitely reason enough for him to think that Ada is behind the whole outbreak, but how plausible is his theory? So far in the series, Ada has always been working for others. It’s hard to believe that she is the mastermind causing all of the destruction. IGN pointed out some mysterious scenes that appear in rapid succession that they found while slowing down the trailer. In some of these scenes an unknown man in a suit is shown, possibly he is the cause of all this devastation. He may even be Alex Wesker, the Wesker ‘family’ definitely plays a part in the game so it’s possible. Then again, it could be Ada’s fault; after all we don’t really know if she is Ada. Despite looking like Ada and sounding like Ada, Capcom have refused to confirm whether or not the woman shown in the trailer is actually Ada Wong. Though they did once say that Ada would play a part in the game so it is most likely her, fans have still begun speculating that the character is a twin or clone of Ada who is trying to frame her. Sounds pretty crazy, but there is a method to their supposed madness, by which I mean a list that, according to them, was leaked a few months back containing the names of characters in the game. Ada is on the list, but so is the name Carla Radames and in brackets beside it is ‘Ada’s clone’. Having not previously heard of the list, I naturally have a hard time believing it, but that doesn’t mean it’s not true. However, I do feel that a bigger deal would have been made out of such a list as it also contains the name Sherry Birkins and Jake Muller, plus it reveals Jake is Wesker’s son. For me at least, pending further information, the list is a hoax. Now back to what we do know. We know that each of the three partners have their own separate story, each focusing on a different style of gameplay, ranging from gothic survival horror to all out action. Leon and Helena Harper must survive the outbreak in Tall Oaks only to fake their deaths after being blamed for the murder of ‘Present Evil’, the zombie U.S. president. 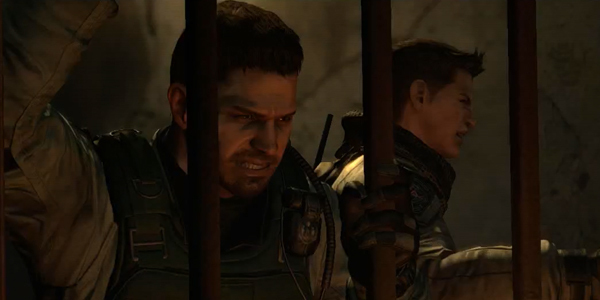 Chris and his, sniper wielding, partner Piers Nivans are put in an action packed army style war against the terrorist. Finally, Sherry and Jake are being hunted by a massive B.O.W., Bio-Organic Weapon, who is intent on capturing Jake on behalf of, for now let’s just say, Ada Wong. With three full campaigns it’s really hard not to be excited about this game; it’s by far the biggest and most elaborate Resident Evil game to date. It’s so big that there have been some rumours floating about that this was Capcom’s way of wrapping up the series, but fear not because, in an interview, people involve in the game have stated that the reason for Jake’s character was to start bringing in younger people to take over as the main cast were getting on in years. With Jake, Piers and Sherry all filled with enough youth for another six Resident Evil games, I think the series is pretty safe for the moment. The game also includes a mercenary’s mode, which this time does not have to be unlocked and is available from the start of the game. Other mini games are expected to be announce in the coming months, hopefully at least one not involve running around looking for extra time. How cool would it be if there was a survival mode were the clock actually ticked up timing how long you could fight off the hordes or zombies and B.O.W.s? That’s my dream anyway, but even if it doesn’t happen I’ll be fine because there seems to be something in the game for everybody. If you, like me, are seriously looking forward to the latest Resident Evil adventure, then you’ll be glad to know that a playable demo has been announced. Unfortunately, it doesn’t come out until September and will only be available for people who buy a copy of Dragons Dogma. Xbox 360 players will get the demo 60 days before PS3 users, but both still need to purchase the game to download the demo, which doesn’t seem fair to people who weren’t planning on buying Dragons Dogma but that’s just how it’s going to be this time around. It would be nice to see the new controls, which include being able to use melee attacks, shoot and walk and even lie down on your back and shoot. Plus, it would be a good chance to check out the new AI, but is it worth buying an entire game? Honestly, if you weren’t already planning on buying Dragons Dogma would you buy it for the demo? Maybe if I had more money I’d consider it. Speaking of wealthy fans, for those Resident Evil fans that are lucky enough to have grave deep pockets, a collector’s edition of Resident Evil 6, containing a replica of Leon’s leather jacket, will be available costing over a thousand dollars. Personally, I tend to avoid collector’s editions that cost more than ten euro more than the regular addition and, since I’m hoping the regular edition of Resident Evil 6 doesn’t go anywhere near a thousand euro, dollar or whatever, I’ll be giving this collector’s edition a miss. There are still several months to go before this game comes anywhere near a shelf, but that doesn’t mean we can’t get crazy hyped up on sugar, annoyingly talk about it to people who don’t care and come up with wild theories about every detail of the game. Honestly, I think that the build-up to a release date and all the speculation is really fun and if you think the same please leave a comment below and let me know what you think of the game and all the new details. Also, if you enjoyed this post, don’t forget to click the like button and maybe even subscribe. There’s pretty much no escaping it, when you were a kid you had that one toy that just stood out from the rest. It’s the one that is probably still secretly stored in the attic, because it seemed so wrong to throw it away. Wouldn’t it be cool if that toy could come to life, and not in a ‘you don’t get to know’ Toy Story sort of way? In his feature-length directorial debut, Seth MacFarlane is making one kid’s, Mark Wahlberg’s, dreams come true. Ted is the story of a child, John, who is granted a wish to make his stuffed bear come to life, but when he grows up he doesn’t grow out of their friendship and the bear, Ted, continues to live with him and is getting in the way of his relationship with his girlfriend Lori, Mila Kunis. Is John ready to let go of his childhood best friend or will he instead let go of his girlfriend or will there be some sort of middle ground? 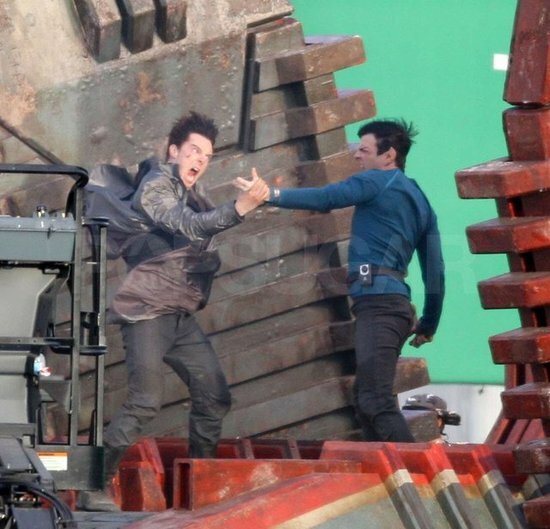 Well we won’t know for sure until the film comes out on the 13th of July, but either way it does look funny. 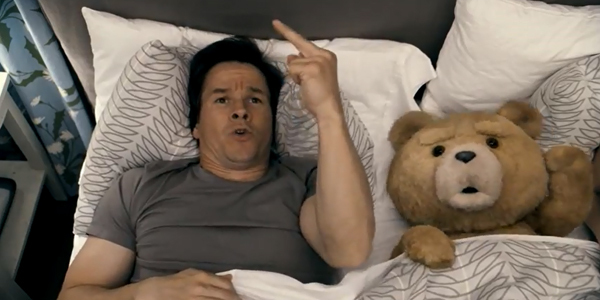 The trailer shows that both John and Ted are pretty immature, but, while you may expect that from a twenty seven year old stuffed bear (or maybe you wouldn’t), a grown man should know better. 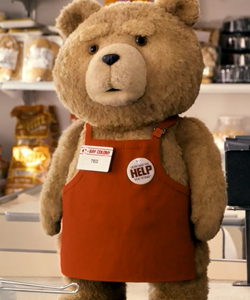 During the trailer Ted can be seen going places that no stuffed bear has gone before, by which I mean doing drugs, drinking alcohol and, how to put this gently, being sexually suggestive with a supermarket scanner and a chocolate bar in an attempt to hit on a fellow supermarket employee. The film seems to have similar humour to that of Family Guy, which is another of Seth MacFarlane’s projects. MacFarlane, along with, Wellesley Wild and Alec Sulkin, who also write for Family Guy, co-wrote the screenplay for Ted. The comparisons with Family Guy are going to be unavoidable, not because of any story resemblance, there isn’t any, but the fact that Ted sounds exactly like Peter Griffin is going to draw these comparisons in, plus there’s Mila Kunis who also plays Meg Griffin in Family Guy. Out of all the voices that Seth MacFarlane does, Peter’s is probably the most suited for the role. It’s not that the characters are the exact same, but they do have a lot in common and Peter has always wondered what it would feel like to be a bear. Imagine how strange it’d be if Ted had Stewie’s voice, it would be a completely different movie. It just wouldn’t fit. The plot seems interesting, but I’m imagining John growing up and letting go of Ted in the end and maybe even Ted going back to just being a regular stuffed bear, which would be a pretty feel bad ending for a comedy. Then again, maybe it will be much lighter. Ted and Lori could work out their differences and maybe even run off together leaving John stuffed and put in the attic, who knows. No matter how it ends, it’s seems pretty clear that if you like Family Guy you’ll probably like this movie. What do you think? Are you looking forward to seeing this movie? Would you like one of your old toys to come to life? Do you think John will have to pick between Ted and Lori? Check out the trailer below and let me know what you think by voting and leaving a comment in the section below. Also, don’t forget to follow and click the like button. Capcom have announced yet another Resident Evil game coming out this year. This time, similar to what they’re doing with Resident Evil 4 and Code Veronica, Capcom will be converting both Umbrella Chronicles and Darkside Chronicles to HD and releasing them on the PS3. These games will be available on the PSN in June and in stores soon after. Now you may be thinking, if you have them on the Wii, then it’s essentially buying the same games twice and you’d be right. The game controls have not changed from the Wii version it’s still a first person rail game. Players have the option of using either the Move controller, which would make gameplay identical to the Wii version, or the regular PlayStation controller, which I imagine would make it awkward and slow down reaction speed. Honestly, this HD craze is getting a bit out of hand. Sure graphics are important, but doesn’t it seem ridiculous that companies can sell the same product again just by making a slight improvement, take that Apple. Okay, so maybe that’s how the world works now, but that doesn’t mean we have to jump on board. If you have it on the Wii, are the improved graphics enough to justify buying the PS3 version? What do you think? Do you have the Wii Versions? Are you going to buy it on the PlayStation 3? How important are HD graphics to you? Let me know by voting and leaving a comment below. Also, don’t forget to follow and click the like button, if you liked this post. The world can be a stressful place sometimes and when you finally get a break from that what could be better than going on a killing spree, I am of course talking about games not real life murder which, for the record, I don’t condone. Anyway, recently I found myself under a lot of stress and couldn’t get my fix of video game violence because of a new hard drive. Unwilling to replay any of my old games I decided that, when the stress eased up a bit, I’d buy a new game. Nothing fancy just something old and cheap. One game stuck out in my memory and I decided to hunt it down. It’s called F.E.A.R. (First Encounter Assault Recon) and it was first recommended to me last year by a guy that worked in a GameStop that has now shut down. After a bit of searching I found the game pre-owned, ironically in a GameStop, and bought it. F.E.A.R. 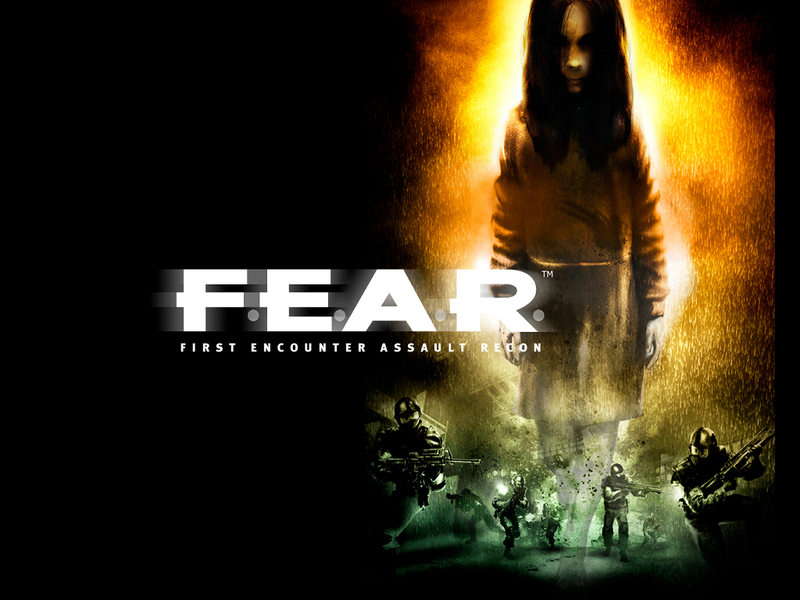 is a psychological horror first person shooter that was released on PC, Xbox 360 and PS3 between 2005 and 2007. The game follows the F.E.A.R. team as they investigate a supernatural phenomenon and naturally you play as the point man, which is a soldier that is sent in first all the time as sort of a lookout. This means that you’re fighting thousands of soldiers all by yourself and to make matters worse, and a lot more fun, the supernatural phenomenon occasionally pops up to scare the hell out of you. As a massive horror fan I think that GameStop guy was right, this game is great. It’s been a long time since I’ve ever been really scared, but this might change that. To add to the atmosphere I’ve been playing the game alone in the dark, I know my commitment is incredible and a little excessive. Naturally, after one day it’s hard to say whether F.E.A.R. is truly worth the GameStop recommendation, but for now I’m really enjoying it and props to pre-owned games. I was considering not getting it because of a bad experience I had years ago, but this seems to run without any trouble and has barely any scratches. So there you go adopt a game, you won’t regret it. What do you think? 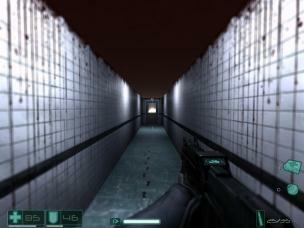 Have you played F.E.A.R.? Do you buy pre-owned games? Are you a fan of the horror genre? Let me know by voting and leaving a comment below. Also, don’t forget to follow and click the like button if you liked this post. The hit 80s television series 21 Jump Street is coming to the big screen with a remake, sequel, parody, I have no idea. Having been born after the TV series had ended, I wasn’t even aware of its existence until I heard about the movie. However, before I saw the movie I sat down and watched some of the episodes and found them to be really enjoyable. I knew the film was a comedy so I was already expecting it to be completely different, which meant it wasn’t really a shock when that turned out to be the case. I’m a big continuity geek, so I really didn’t expect to like it as much as I did, but I can honestly say that I laughed for basically the entire film. There are some references to the original series in the film, but I wouldn’t exactly call it a sequel or follow up to the series. 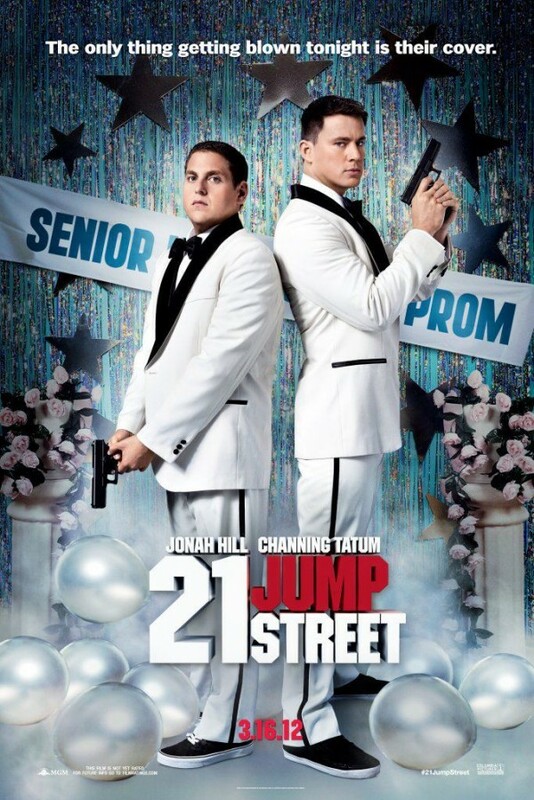 Still, it’s not a remake either and I found it to be more of a parody than anything else and not just a parody of 21 Jump Street, but movies in general. Even going as far as characters being aware that they are merely stereotypes and being encouraged to embrace it and things, that would normally explode in film, not blowing up. Unexpectedly, Jonah Hill and Channing Tatum make a great team and, even though the characters are opposites, it was done it a way that makes their friendship really believable. However, the gay vibe was coming off strong and at times it did seem like the pair would make a pretty good couple, I can only imagine what reaction that would have got (Oscar nomination probably). The two main characters are stereotypes themselves, but they use that to show how high school has supposedly changed since they were actual students. Johnny Depp makes an appearance in the film as, I’m going to say, a version of his former Jump Street character Tom Hanson. His part was very well done and completely unexpected. I think that people who are fans of the original won’t like what they’ve done with his character, but then again I don’t really think fans of the series are going to like this film. It’s very funny and I did love it, but I know that if in years to come a show that I loved is turned into a movie that bears little resemblance to the show I wouldn’t like it. So if you’re a Jump Street fan, oddly enough, this may not be the film for you. Basic plot aside, there really is no real resemblance between the film and the show, the entire tone has been changed and let’s face it Channing Tatum is not going to pass as a teenager, though he was really good in the film as was Jonah Hill who actually co-wrote the script. The film will be in cinemas on the 16th of March and I would recommend it because it’s really funny, but if you’re a massive Jump Street fan don’t expect anything like the original show. What do you think? Are you going to see this movie? Did you like the show? Would you like to see the TV remake of Jump Street? Let me know by voting and leaving a comment below, also don’t forget to follow and, if you like this post, please click the like button. 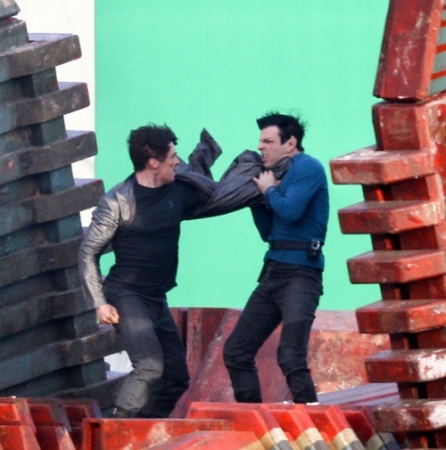 Pictures from the set of the new Star Trek movie have been released, but what do they reveal about the films plot? 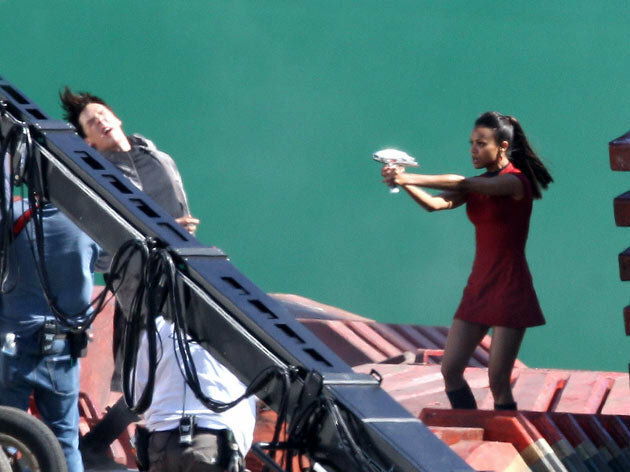 Not much is known about the, still untitled, sequel to 2009s Star Trek, except that it will include elements from the original series. Fans have speculated about who the villain will be ever since the sequel was announced. We know that British actor Benedict Cumberbatch will be playing the character, but we don’t know which one he is portraying. 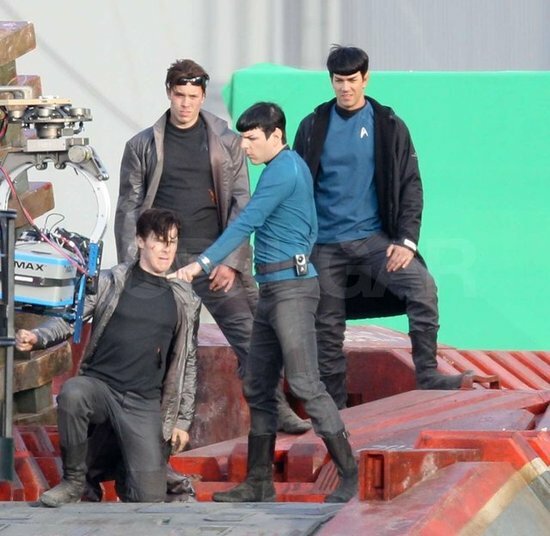 The set pictures do give some clues though, we now know that he is human, or at least looks human, and is a member of Starfleet. 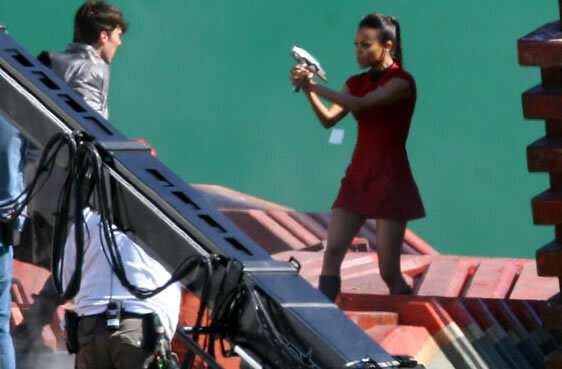 The pictures show Cumberbatch’s character locked in battle with Spock, played by Zachary Quinto, and Uhura, played by Zoe Saldana. 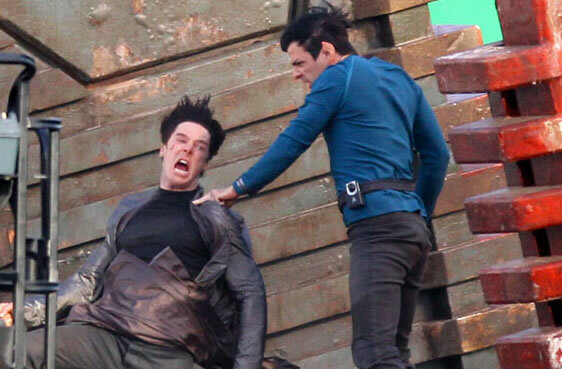 Cumberbatch is wearing a black shirt and you can see that the Starfleet logo is on it. What villain could he be? Personally, I have no clue and I don’t want to insult any true Star Trek fans by trying to back a guess. I’m going to leave it to the people that are more knowledgeable about the series, so if you have any ideas please comment and let me know, enjoy the pictures. What do you think? Which Star Trek villain do you think it is? Are you a Star Trek fan? Do you like the rebooted film series? Let me know by voting and leaving a comment below. Also don’t forget to follow and, if you liked this post, click the like button.